As a rider who clocks in 10k-20k miles a year on a bike, I'm often engaged in conversations with inquisitive non-riders, tinkering with the idea of riding. Some think they need to get a motorcycle to get training, some think they won't need an endorsement if they ride a scooter and others haven't a clue about what it takes to get going on two wheels. One thing they all have in common is they are interested in exploring more, and while my conversation with them may answer a few questions they have, the idea of this piece is to answer more than just a few. Taking a three-day training course is the place to start. You don't need a bike to take the course, in fact, for a beginning rider course you typically must use a bike provided by the state or the contractor you signed up for the course through. These bikes are low powered and easy to ride, the idea being you'll be tooling around on a closed range for several days in nothing more than 1st and 2nd gear. If you're drawn more toward the idea of riding a scooter, many range operators offer several scooters in their fleet as well. Training is a great way to determine if riding motorcycles is for you. If after several days you are unable to pass the class, keep the bike upright and are still scared stiff, it's probably a good idea to bag the idea of riding as a life-long dream. But this is not the common case. Most riders pass and move on to getting their own bike and taking up the passion. Any rider who is not doing well, but is determined to get over the hump can often get a little one-on-one tutoring which is often offered as a second option from range operators, or may be readily available from a private instructor. Being trained by an uncertified trainer, such as a better half, other loved one, buddy or friend of a friend is simply bad business. Unless such a mentor is a certified instructor, this person has no business helping you get started. In class there is a proper curriculum that gets you up to speed about balance, controls, cornering, braking, lane positioning and more. Get your training only through a certified instructor that follows a specific curriculum. Tell the others thanks, but no thanks. Links for training in the Pacific Northwest are included below. Consult your search engine for additional states. Even if you only plan to operate a scooter, you will need an endorsement to ride on public roadways. Most modern scooters exceed the standards set forth by the various states which include engine size, maximum speed and wheel size. Those standards were set in place years ago for mopeds and haven't changed much since. Do not be misled by a dealer who says you don't need the endorsement, do your homework to confirm your state's requirements. If you take a state-approverd training course discussed in the previous section, you will recieve both a written test and a moving test at the end of the three day period which will satisfy testing requirements for an endorsement. You simply need to bring your certification of passing both tests to your local DMV or DOL and bingo, you get a new license with your endorsement noted. You've got the endorsement and you're ready to ride. Now it's time to get a bike. Start off small. If your ego is pushing otherwise, go lock it in the closet for a few months until you're ready to graduate to a larger bike. A simple used 250cc bike is a great way to get your chops up in the street. Remember, you haven't even shifted to 3rd gear yet, why would you want to be attempting higher speed travel on a 500 or 700 pound behemouth? The sensible move of starting out small will allow you to get used to riding at higher speeds while minimizing the weight you'll be balancing, making getting started a whole lot easier. Most Japanese 250 standard, dual sport and crusier models such as Honda's 250cc Nighthawk, Rebel or XL250; Kawasaki's 250 Ninja or KLX 250; Yamaha's V Star 250 or XT250; and Suzuki's GZ 250cc models are all a good reliable choice. And the beauty of these models is the resale value stays high, so when you're ready to trade up a few thousand miles later, you won't lose much on the sale. Some riders have actually profited. Other riders often keep the 250 for an around-town commuter. In an effort to keep your body intact in the event of a fall, or keep it protected from the elements, you'll want to get some genuine motorcycle riding gear. Imagine yourself in a 1/2 shell helmet, blue jeans, a leather vest and flip flops. You come off the bike in a low speed crash. What condition are you in now? Think you could walk away from that incident? Now imagine youself in a full face helmet, leather or textile riding gear with padding at the shoulders, elbows, back, hips and knees. You have on leather gloves and boots and now you come off the bike. On low speed crash most riders will simply get back on the bike and be fit to ride away. Even in a higher rate of speed crash, those who are dressed for the crash typically fare better than the "feel the wind in my face" set. We like to think of the first three thousand miles as being the most critical. This is when you're getting used to the controls on your bike, the ergonomics, catching up with the rapid rate that things occur around you, riding at highway speed if you plan to do that, crossing over grated bridges and railroad tracks, or simply riding the bike along a twisty road. Oh - and let's not forget that soccer mom in the SUV who just turned left in front of you. She didn't see you - were you ready for that? Everyone and everything around you is a potential hazard when you ride a motorcycle. Make that your mantra. And don't ride those first three thousand miles over three years. Make a concerted effort to get those miles in over the course of several months. For commuters, this is easy, for leisure riders this may seem a little tougher to find the time for. Taking a motorcycle training course is the first step to what should be a regiment of continous training throughout your riding career. We're trained through auto driver ed that once you pass the class you're set. If you use that mind set in motorcycling you'll never learn much beyond what they taught you on the range - and that is not enough. Motorcyling requires twice the motor skills and brain functions as driving a car, so you will want to continue your education. I often ask experienced riders if they know concepts like the delayed apex, the vanishing point, reading the road and other advanced techniques. More than not, the answer is either 'No' or some mis-interpretation that lends itself to the fact they do not know the techniques. But these techniques are essential to better and safer riding. 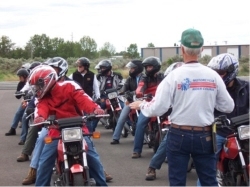 A basic rider course is the equivelent to about passing the 8th grade. Now it's time for four years of high school and four years of college at least. This can be done by taking more advanced training offered by states and local contractors one course at a time. You can also take a track school or two if you're inclined. In the past, I've even gone as far as to take sidecar training, even though I had no plans of owning one. Mix it up and keep it interesting. I personally like to take a new class about every two years. Books are an excellent way to get some new concepts under your belt as well. Professional authors like David L. Hough, Lee Parks, Pat Hahn and others all have their own interpretations of advanced concepts to share and you can learn a lot reading any of their books. New books hit the market all the time. While taking advanced classes and reading books will fill your head full of new information and techniques, you must learn to sort it all out and apply it to your riding. That can't be done all at once. The best way to do this is to take it to the street one concept at a time. Even from your very first ride in the street, use all the skills you learned, but focus on a particular skill, such as braking or throttle control until you master each to where you are comfortable with your ability to execute the manuever. Then continue on to a new technique. The goal here is to move techniques like throttle control, braking, swerving and other essentials from the concious mind into the subconcious mind so they are at the ready without you having to think much about them. The only way to do that is to work on these techniques during real world riding. What they taught you in class the other day will need hours of time before you master it to the point where it becomes part of your subconcious mind. Once that happens your skills level moves up a notch. Special note: Riders, feel free to share this link in an email with non-riders so you can help them understand how to get started right and enjoy a life-long riding passion. To reprint this article in a club newsletter or website at no charge, email your request to the editor now.